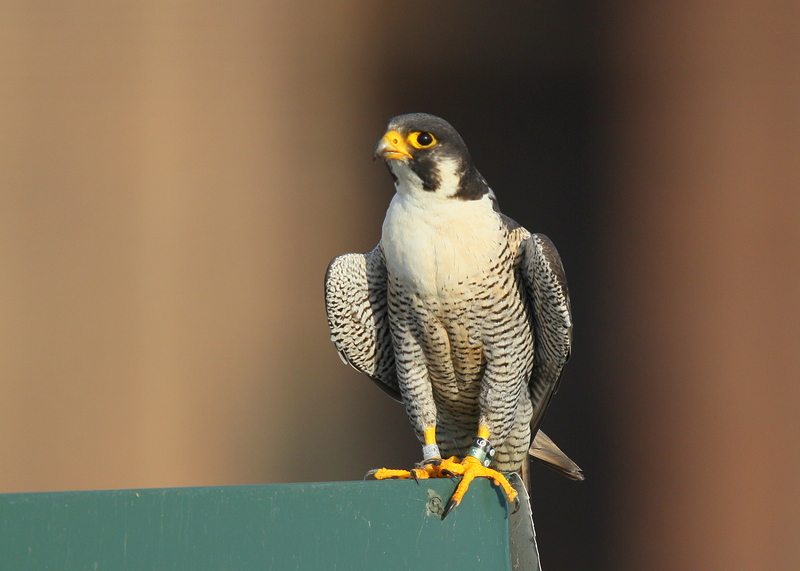 A late afternoon view of the female peregrine in the nest box alone. 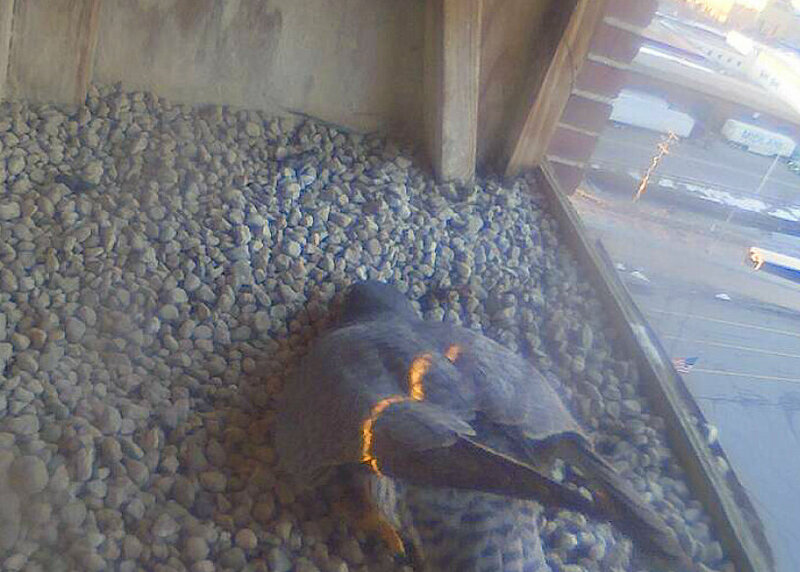 She appears to continue the process of scraping the gravel in the nest box in continued preparation for egg laying. 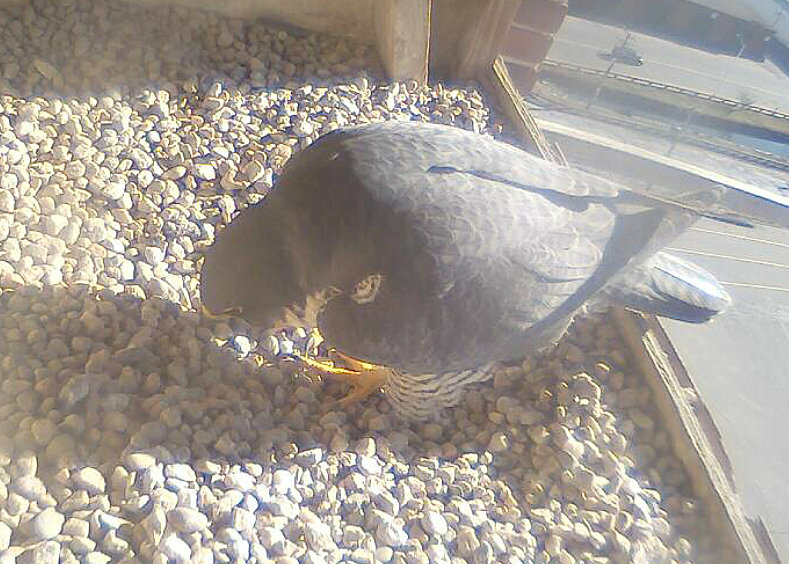 Also the female has been seen picking at pieces of gravel, as if doing a bit of house cleaning. 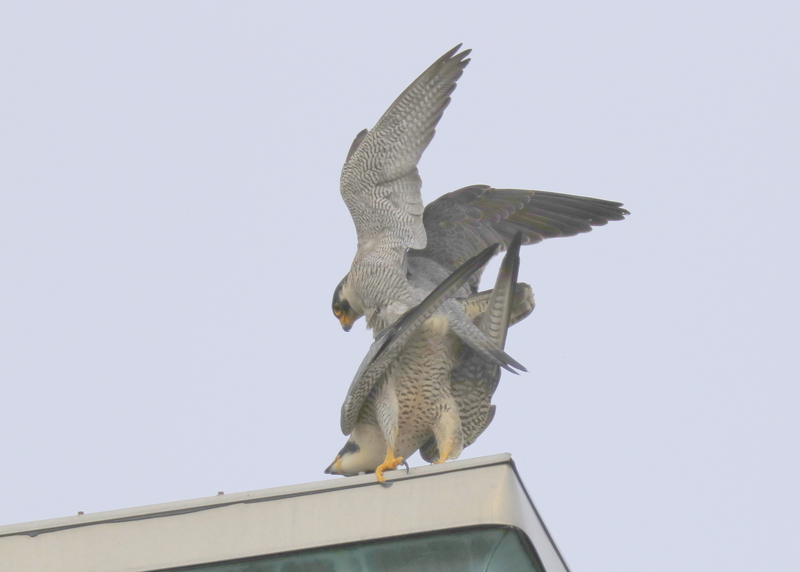 Lawrence Peregrines: report from battle field! Good Morning! My sons and I have always been avid bird watchers, this experience is one of the top ones! Of course any pictures my son took and story can be shared. I’m just taking the lead on the emails and investigating information. It was the unrecognizable screeches that brought us outside to witness this event. The birds were the same size, but the younger clearly the advantage in aggression. The 20 minutes on the lawn was what it took to get in touch with Tom as we tried to call animal control and were sent through a series of phone calls. The entire time the younger male stayed in close range being very intimidating vocally. The bird on the ground seemed unhurt and we sensed it appreciated our guard or else we would have backed off. Growing up around all sorts, big and small I have never seen such aggression once humans intercepted. That he flew between us was a little unnerving, and my read on the photo Rob took with the falcons stare of, ” you want to be next” message in his eyes. Rob and I feel very fortune to witness this event and the world that it has opened up for us. Thank you so much for reaching out! There is so much information, we are a little overwhelmed, or at least I am. I hope to keep in touch and that you have a great day. For now it’s back to the live view! Thank you! 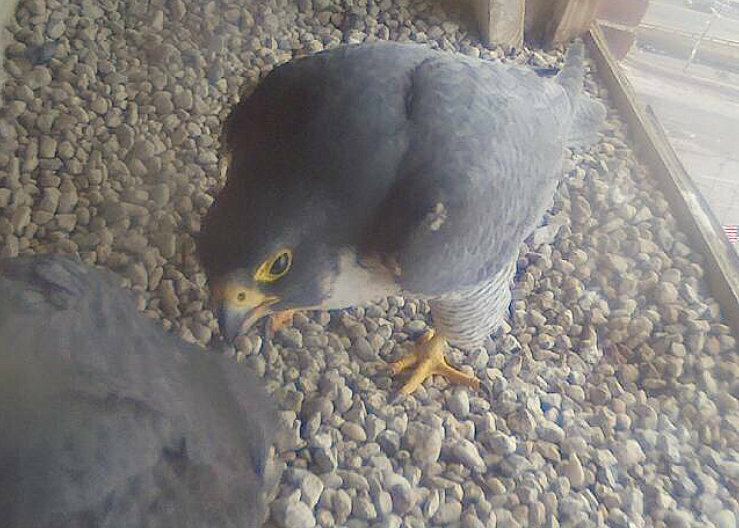 Lawrence Peregrines: new male in the box? Made a mid-morning visit tot he nest box and observed an interaction with two peregrines in the nest box. At the time it looked like the ongoing pair of peregrines. But upon closer look, it appears that the new male is in the box. The bird seen has a silver, federal leg band on its right leg and no left leg band. This is consistent with the new male, who may have been making a visit of two over the past few days…..stay tuned! They are engaged in head bowing and vocalizing with each other. 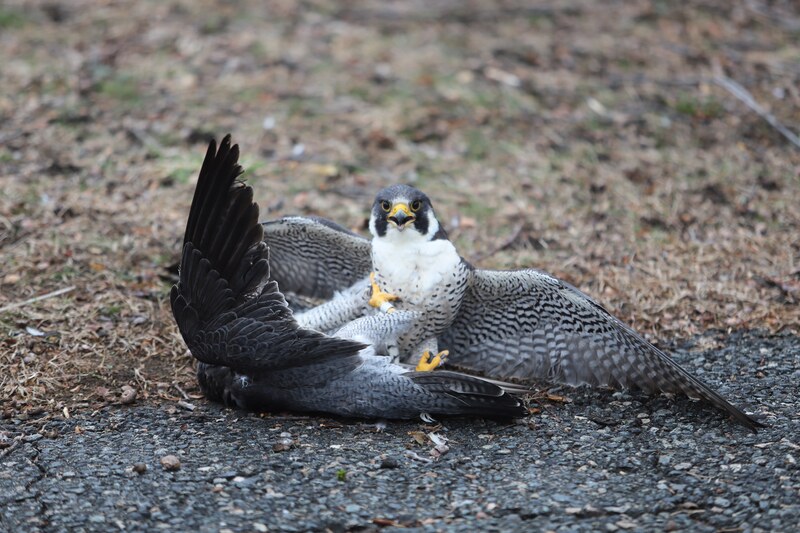 Today, I received a call from Robert Carlson that two Peregrine Falcons were fighting on the front lawn of his house in North Andover, Essex Co., MA. 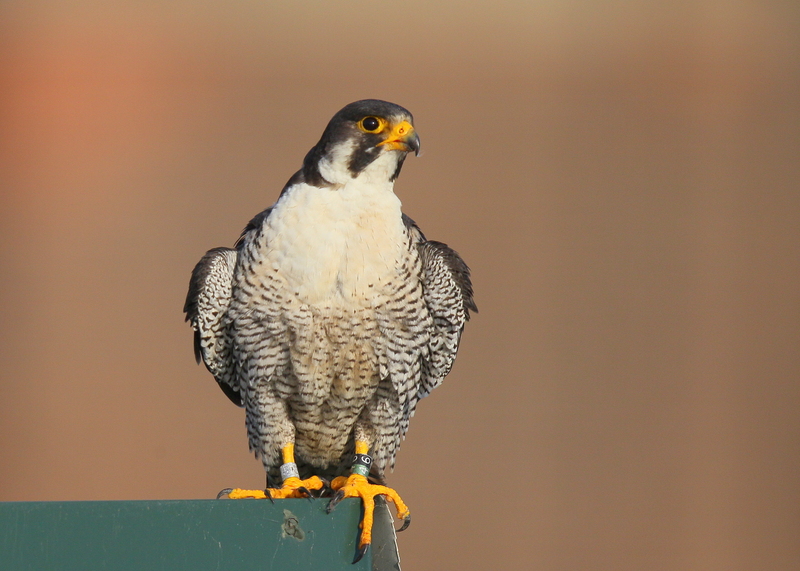 When Robert and his mother came outside from the house to look, one of the falcons flew off after about half a minute, but the second bird did not. Eventually four people approached the second bird to about three feet away on two opposite sides. The first bird came back swooping between the four people standing six feet apart striking the bird on the ground. The first bird repeated this one more time, striking the bird in the ground, before leaving. The grounded bird remained on the lawn for about 20 minutes in spite of people standing so close, and did not fly until they attempted to place a box over the bird. It is not known if the bird that flew off was banded, but the bird that stayed is banded 6*/4* black over green (type 6 band). This is the original resident male that has been nesting in Lawrence since 2003. This bird is now 17 years old bird and clearly lost this battle, so it will be interesting to see if he is able to maintain his place as the resident male in Lawrence for the rest of the season. Here is his original banding information. Another series of early morning interactions inside the nest box between the male and female. They continue with bowing and vocalizing where they bow to one another and make an “ee-chup” type sound. During this type of courtship display they may also touch bills. The female is facing the male, and she has no leg bands. 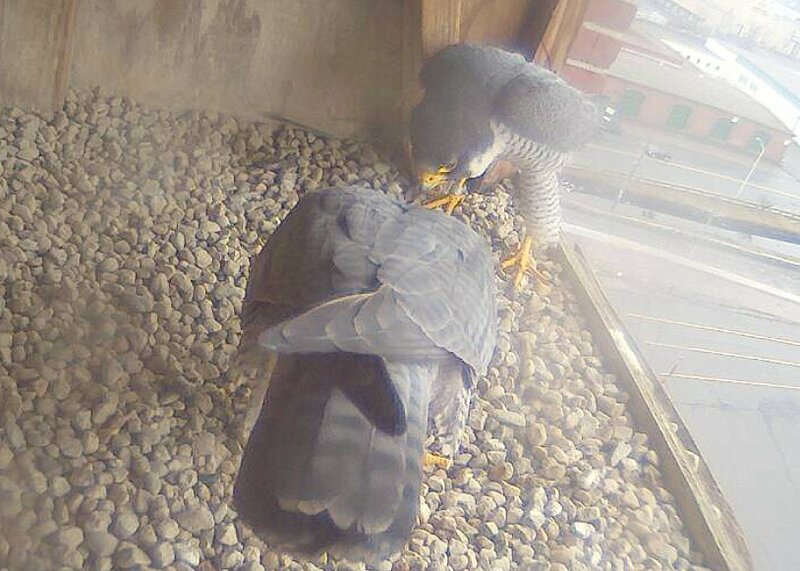 Lawrence Peregrines: even more scraping!! Another beautiful morning with a few clouds, winds SE 3MPH, and temp around 37F. 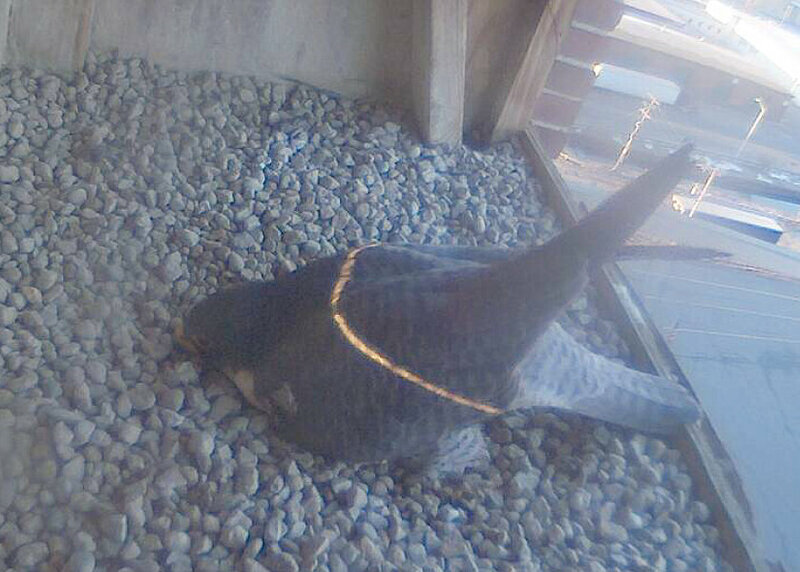 The female continues to leave the nest box for a while and then return; again she enters the nest box and repeats the process of laying out horizontally and pushing the gravel around. This helps her to fashion the nest bowl to her liking and is all part of the preparing for egg laying! SCRAPING: Either bird can do this. 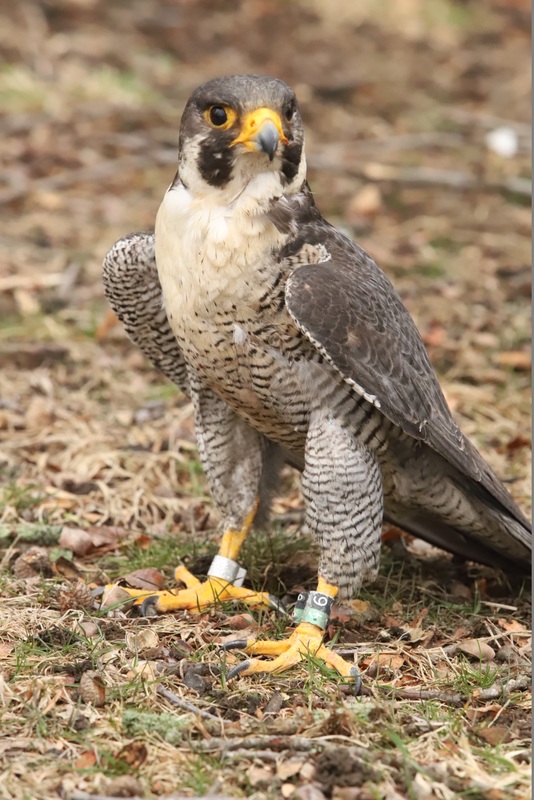 The falcon runs its breast through the substrate or nest depression, pushing out with its legs behind. The bird is forming the nest cup (scrape), but this is also part of courtship. Scrapes may be made at several potential ledges before one is finally chosen for laying. Another beautiful morning with clear skies, bright sun, little wind, and temp around 24F. The female continues to leave the nest box for a while and then return; again she enters the nest box and repeats the process of laying out horizontally and pushing the gravel around. This helps her to fashion the nest bowl to her liking and is all part of the preparing for egg laying! Another beautiful morning with clear skies, bright sun, winds N 12MPH, and temp around 30F. 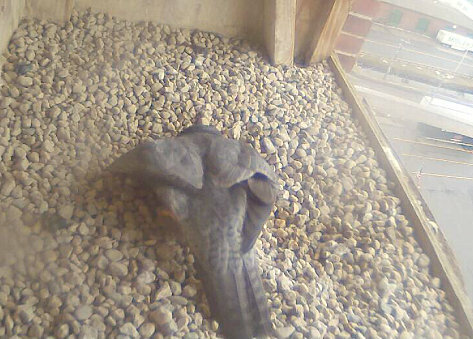 The female continues to leave the nest box for a while and then return; again she enters the nest box and repeats the process of laying out horizontally and pushing the gravel around. This helps her to fashion the nest bowl to her liking and is all part of the preparing for egg laying!